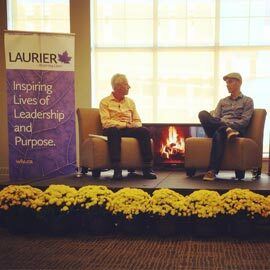 Laurier hosted Tobias Lütke, CEO of Shopify Inc., for a “fire-side chat” with Steve Farlow, executive director of Laurier’s Schlegel Centre for Entrepreneurship, on Oct. 1. The two spoke to a room full of energized and excited students about the possibilities of the Internet, entrepreneurship and Shopify’s expansion in Waterloo at the former Seagram Distillery building on Erb St.
Shopify Inc. is an e-commerce software startup that began as a snowboarding equipment online retailer. Lütke soon realized that the e-commerce software he created for his retail website garnered a lot of interest from fellow small business owners and saw an opportunity to provide a much needed service. After years of hard work and some luck, he has been able to turn his Ottawa-based e-commerce software into a billion-dollar company. Lütke, 35, attributed his success to his background as a programmer and his entrepreneurial spirit, which started at a young age when he would sell toys to his classmates that he had purchased at a discount. He further recognized the importance of support from friends and family, as well as having opportunities to fail, as significant factors to being a successful entrepreneur. Lütke also spoke about the addition of 300 jobs to Shopify’s existing 30 people in Waterloo with Shopify Plus, the company’s e-commerce software that will be made available to “large-volume” retailers. Waterloo has been a prime location to develop Shopify Plus, with the tremendous enthusiasm from the community and the local talent from Laurier and the University of Waterloo. When looking to build the Shopify Plus team in Waterloo, Lütke said he looks for candidates that deeply care about what they're doing and are excited about making the future happen soon. Lütke further stressed the importance of an Arts education, noting that success in the future will not be because of what you know, but how you react when you don’t know something. Laurier continues to broaden postsecondary education to include entrepreneurship across disciplines, ensuring every student at has the opportunity to experience entrepreneurship at Laurier. Find out more about entrepreneurship at Laurier.